So, it’s March. My calendar says so. Late March. Spring is actually here. Would someone PLEASE tell Mother Nature?! It’s still so cold and I’ve been cold since October and I’m over it, Winter. Seriously, be gone with your wind chills and your snow and your coats and gloves. Be gone! As much as I dislike winter, I lovelovelove all the cozy, winter food. So if winter refuses to exit stage left, I’m gonna keep cooking my winter favorites! 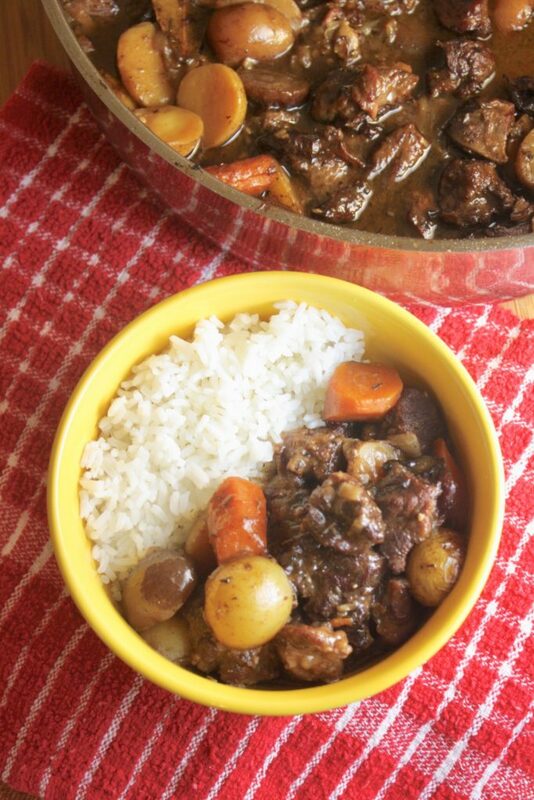 Beef Stew is the ultimate one pot meal. You’ve got your meat AND your veggies braised in a delicious sauce. You can braise on your stovetop or in the oven or in your slow cooker for a hands-off approach. Either way, you can have an inexpensive and hearty meal on the table with a a HUGE bonus. Your house will smell DIVINE while this cooks. Here are the deets! What cut of beef should I use? I like beef chuck, an inexpensive cut from the cow’s shoulder area. If not cooked properly or long enough, beef chuck will be TOUGH. Cows use their shoulder muscles A LOT, which produces a tough piece of meat. Braising is the perfect cooking method for inexpensive cuts of meat. The longer cooking time in a flavorful liquid (broth, wine) breaks down the collagen in the meat, making it fall-off-the-bone tender or fork tender. What veggies should I add? Onions, carrots and potatoes are staples but feel free to add your favorite root vegetables into the mix. Root vegetables are typically denser and can withstand the long cooking time a braise requires. Diced rutabaga, parsnips, turnips, shallots, and butternut squash are all delicious additions. How do I make sure the sauce thickens? Your braising liquid helps tenderize your meat. It also adds flavor to the meat and veggies. To make sure it reaches the right consistency you’ll need a thickener. Lightly coat your beef in flour before you brown it. The flour gives the beef a nice crust and helps it brown. It will also thicken your sauce as it simmers into your braising liquid. 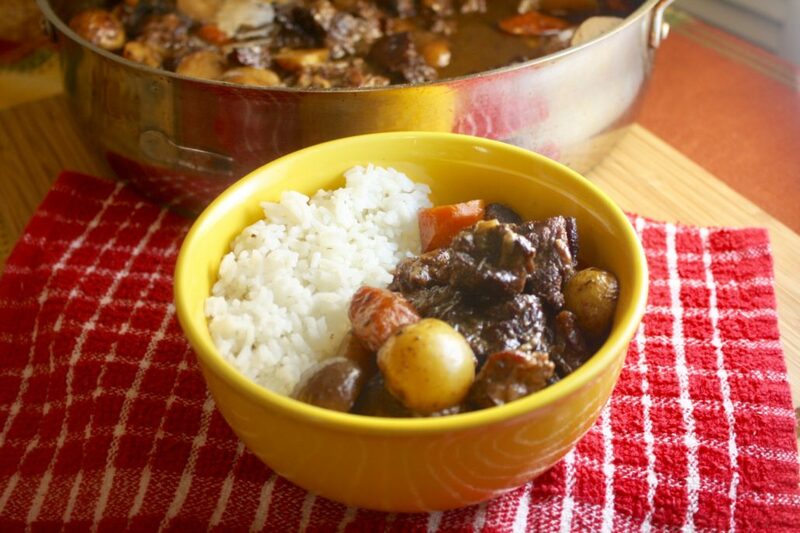 Braising is the cooking method you’ll use to make your beef stew. It’s so simple and after a little bit of chopping and browning your beef, the process is largely hands-off. 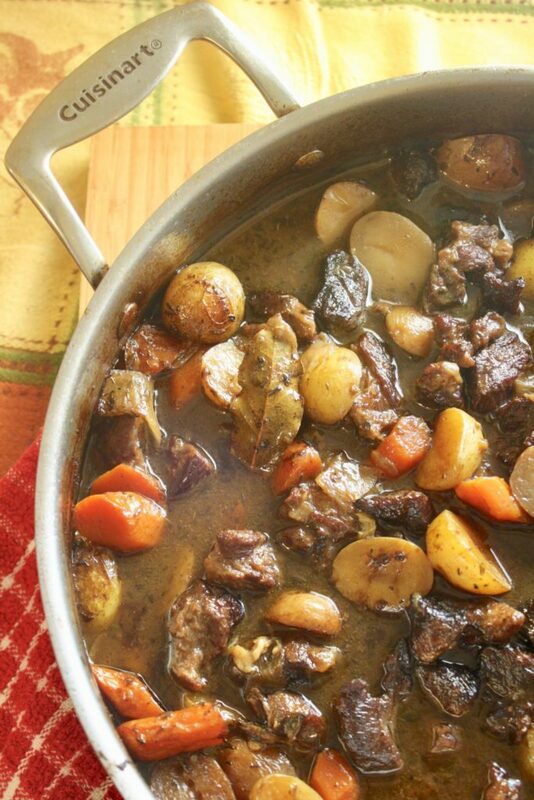 You’ll need to check on your stew periodically to make sure your braising liquid hasn’t evaporated away, but that’s it! You can get step-by-step instructions for braising anything here or download my Braising Tecnique Tip Sheet so you’re ready to braise like a pro! Brown beef in batches to avoid overcrowding your pan. Cut onions, carrots and potatoes into chunks about 1-inch pieces. Cut them too small and they won’t withstand the long cooking time. Use a hearty, flavorful red wine. This is no place for your sweet reds. Heat olive oil in large heavy-bottomed pan or Dutch oven over medium high heat. Season beef with steak seasoning or salt and pepper. Toss beef with flour then add to hot pan. Sear beef in batches until it’s brown and crisp, 4-5 minutes. Use a slotted spoon or tongs to remove beef from pan and set aside. Repeat with remaining beef. Add onion, garlic, carrots and potatoes to pot. Sweat 4-5 minutes until vegetables begin to soften then stir in thyme and red pepper flakes. Return beef to pot and deglaze with red wine. Add broth and bay leaves. Bring to a boil then reduce heat to simmer. 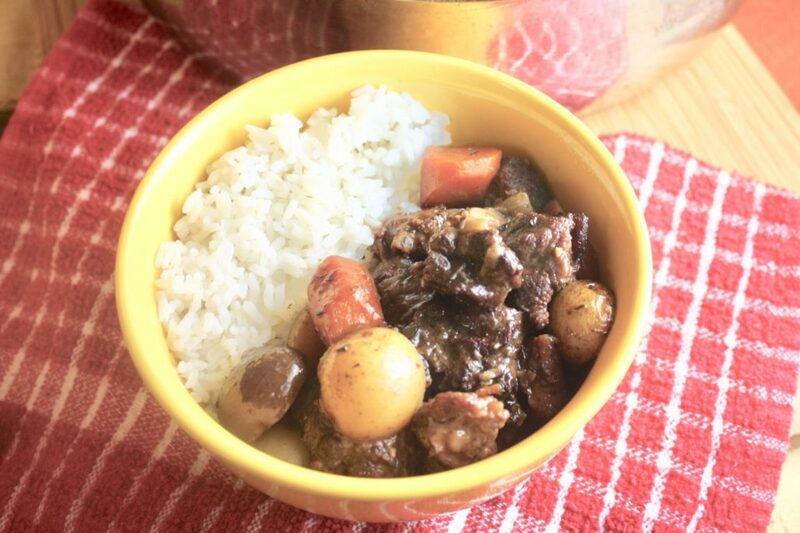 Cover and continue cooking until beef is fork tender, 2 – 2 1/2 hours. Stir stew occasionally throughout cooking to make sure nothing sticks to the bottom of the pan. Remove bay leaves from pan and serve with rice.